Advertisers are coming up with sneaky ways get their products known. One of the infamous ways has been given the name "native advertising". This means that companies are making their ads look similar to online articles on the website they are being posted to. These ads trick customers and make it more difficult for them to tell the difference between what is an ad and what is an editorial. Here's a link to 12 Examples of Native Ads for examples of how sly these native ads and their creators can be. Many believe that people have the right to know when they are viewing paid advertisements. There is an issue that transparency between the readers and the company is becoming nonexistent. Even movies and television shows have certain placement of products that are meant to be subtle. The best way to win over the trust of their readers and viewers is to disclose who the publication is promoting and which posts have and will be considered native ads. The problem that most news and information staffs are having is that advertisers are taking charge of the content that is sent out in these types of ads. Social media is a prime example of companies lacking disclosure on what is an advertisement and what is real news. Most companies don't use the word "advertisement" with these ads, but use other words that would imply that this is an ad. Twitter, for example, uses the word "Promoted" and Facebook uses the word "Sponsored", but neither come straight forward to say that these posts are advertisements. 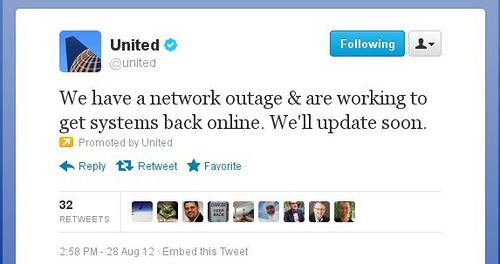 Photo via Hashtags - This picture shows the yellow arrow with the statement following that says "Promoted by United". Photo via Amadeus Blog - This picture shows the a "Suggested Post" on Facebook and the word "Sponsored" towards the bottom of the post. Many people would not associate these words with these posts being paid advertisements and that is exactly what native advertising is. They work to blend in and intrigue you into reading more information about these companies. New guidelines have surfaced with these new ad techniques. Disclosure of these ads have become necessary, especially when these ads blend into the web page's typical formatting. Keep an eye out for other Native Ads by educating yourself on the different types of native advertising. The main driving point for the argument against native advertising is that readers simply want to know what is an ad and what is news. The problem isn't just on the advertisers trying to sell a product, but the journalists that help with creating and publishing these ads, too. There is a definite need for separation of journalism news and advertising. The best way for writers to distinguish between native ads and editorials would be to use the words "Sponsored Content" or some other combination to show that the native ad is actually an ad. Another suggestion is that companies should NOT use the same or similar font to the editorials in their publication so it is made more obvious that these are two separate things, news and advertisements. My PRSA offers some helpful tips for advertisers to consider when creating native ads and how to show that these are not the same as their editorials.